To plan the trip from Hiroshima to Iga–Ueno, which took around 6 hours at the time (I assume travel times have shortened in the time since), I went to the tourist information centre in Peace Park in central Hiroshima, about 200 metres from where the atomic bomb was dropped in 1945. (I had lived across the street from this location the first month I was in Japan, before relocating to the suburbs, and had been able to see ground zero out my kitchen window.) While the lovely ladies at the desk looked up train connection options, I watched televised footage of the carnage that was going on in Kuwait at the time. Saddam had torched the Kuwaiti oilfields, prompting George Bush Sr. to order the invasion that would drive him back to Baghdad. Train information and tickets in hand, I was finally ready to make the trip. It was only a weekend trip, two days and one night, so I packed light, but made sure to take my two ninja books with me for reference. 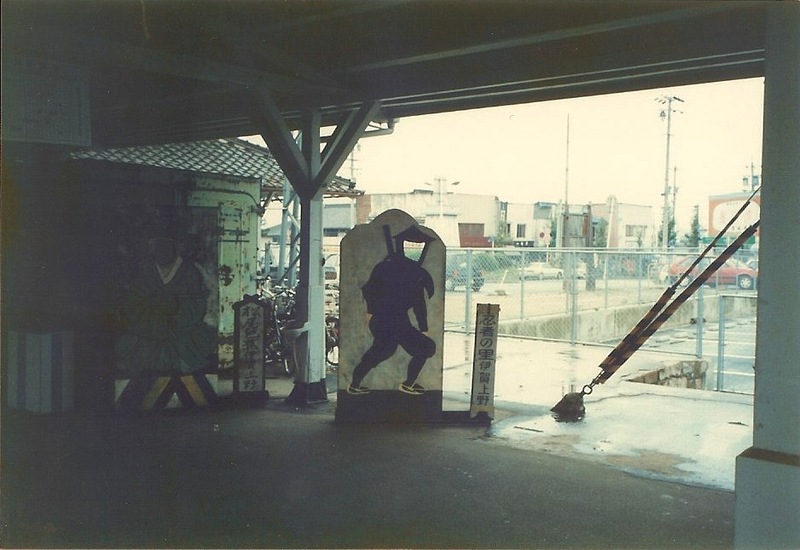 I got as early a start as possible, and made it to Iga–Ueno station early on the Saturday afternoon, images of the mystical ninja floating in my teenage head. Exiting the station, the reputation of the city as the home of the legendary shadow warriors was immediately apparent. I couldn’t bring myself to pose behind the mask. I was looking for the real deal, not a propped up wooden cut-out for tourist photos. From the station, I made my way to the ryokan inn where I would be spending the night, checked-in, and then excitedly made my way to the ninja museum, where I was sure to find the next clue in my search for Hatsumi Sensei. The ninja exhibit was fascinating, complete with purple-clad kunoichi female ninja agents, a creaking nightingale floor, hidden compartments, and trap doors. But I was really after information about the living master himself. Proceeding into the museum proper, I slowly made my way past the many exotic artefacts, pausing to inspect them, unable to decipher the Japanese descriptions. Approaching one glass display case, I stopped in my tracks – I had seen something that I recognized. Underneath the glass was a partially unfurled makimono scroll. I had seen this very scroll before – there was a photo of it in one of the books I had brought with me! I excitedly ripped open my pack and quickly leafed through the book until I found the corresponding image. There was no mistake – the photo in the book was of exactly the same object I was looking at, as if I had taken it myself only moments before. This was a valuable clue in my search – it provided a link between what I had read about the ninja warriors and the exact place where I was physically standing in that moment. Surely a meeting with Hatsumi Sensei himself was only moments away! I flagged down one of the few staff floating about the place, and in my awkward Japanese asked about Hatsumi Sensei. Her response was a blank expression. Hatsumi Sensei? Bujinkan? Another blank look. When I persisted, she wandered off to find a more senior person who might know more, and soon returned with an elderly gentleman. Between my dreadful Japanese and his attempts at English, he made it known in no uncertain terms that he knew nothing of the whereabouts of Hatsumi Sensei or of anything regarding the Bujinkan organization. I couldn’t believe my ears. I had come all this way to find him. And the photo in my book was proof that I was on the right track! How could the staff not know anything? I tried again to get more information from them, but they simply shrugged, and as the afternoon waned, I left the museum, crestfallen. On the way back to the ryokan, I tried to make sense of what had happened. I was obviously at the right place – the photo in my book was proof of that. There could really be only one explanation. The staff had lied. There must have been some invisible, unspoken test that I had unknowingly failed and, having been deemed unfit for acceptance into ninja training, I had been sent away empty-handed. From what I had read of the elusive ninja in the books by the American student (who, by his own account, had managed to gain acceptance into the clan himself), it was likely that they were watching me right now, monitoring my movements. Maybe the ryokan staff themselves were also in the employ of the clan. Perhaps if I conducted myself well, someone would appear and tell me that I had passed the test after all. These were the thoughts of a 19-yr old from a small Canadian country town, brought up on fantastical ninja books and then transported into the mystical homeland of the ninja warriors, only to be denied in the end. No ninja appeared at the ryokan that night. Or the next morning. There was little else to do but have a look around Iga–Ueno, including the castle. Photos were not allowed inside, but I did take a picture of an old palanquin from the doorway. This would have been carried on the shoulders of two retainers, the person of importance, such as a regional feudal daimyo lord, seated in the red box-like structure in the middle. I also got a shot out across one of the tiled roofs – tiled roofs are very exotic – and one of the castle moat, which conveys the mystique that I had come to associate with the image of the ninja through the books I had read. The day was passing and it was time to return to Hiroshima. No ninja having appeared, it was with a heavy sigh that I boarded the train and watched the misty mountains of Iga pass slowly out of sight. Posted on September 18, 2012, in Bujinkan, Life in Japan and tagged bujinkan martial arts, Japan, Masaaki Hatsumi, ninjutsu. Bookmark the permalink. 6 Comments. Really loving the adventures of a Canadian in Japan. Can’t wait to read the next part and I hope you get a chance again to come to our Norrköping dojo here in Sweden. So exciting! I never knew that you had had this experience. Exciting but a let down. Looking forward to the next segment.